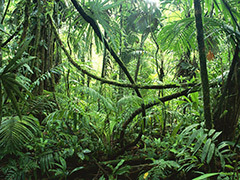 New scientific research shows that plants in the Amazon Rainforest are migrating upward so they can survive. But, scientists aren’t sure theplants are migrating fast enough. According to an article recently posted by National Geographic, the average temperatures are expected to rise by 7 degrees Fahrenheit by 2100 – or sooner, which could mean the extinction of 50 percent of tropical species. If temperatures rise higher than that, we could be looking at the extinction of 90 percent of tropical species. The Andes Biodiversity and Ecosystem Research Grouphas discovered that plant life in the Amazon isn’t going down without a fight. Since many of these species are unable to survive in these rising temperatures, they are migrating higher and higher to get to cooler temperatures. “Tropical Andean tree species are shifting roughly 8 to 12 vertical feet (2.5 to 3.5 meters) a year on average—the arboreal equivalent of a dash. Yet for those trees to remain in equilibrium with their preferred temperatures, they need to migrate more than 20 vertical feet a year,” the National Geographic article states. Scientists are concerned that these plants won’t make it high enough fast enough. If this is the case, the ramifications could affect all of us. Not only do the tropics affect temperature around the world, but also rainfall and weather patterns. If these plants go extinct, we could be looking at accelerated global warming and less rainfall – inevitably affecting our food supply. Let’s hope that the United States starts taking global warming and the reduction of greenhouse gas emissions seriously, before it’s too late for these plants … and for us. Posted on September 27th under Global Warming Issues.